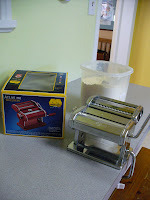 Santa brought me a pasta machine for Christmas. And here's the problem with pasta. It's virtually impossible to photograph the process of making pasta because, from the minute you start a recipe, you (and the rest of your kitchen) are covered with flour, egg or some combination of the two. 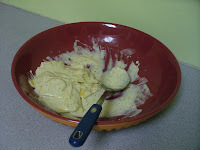 To paraphrase our former Secretary of Defense Donald Rumsfeld, pasta, like democracy, is messy. Always a way with words, that Rummy. 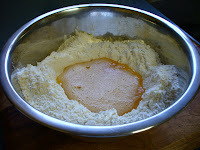 In its early stages, the dough sticks to everything. EVERYTHING. With a passion and determination that shames even the most persistent wood tick. There's lots of flour. In the dough. For dusting. For dredging. On the counter. One the floor. It's everywhere. I mean, EVERYWHERE. I found flour IN my shoes this morning, for god's sake. 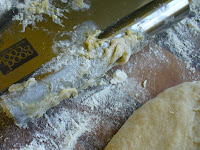 Except for the 30 to 45 minutes or so the dough rests, you are never, EVER without pasta gunk on your hands. Forget anything that requires manual dexterity. Opening a drawer? So not happening. Answering the phone? They'll call back. Petting the dog? Only if the recipe calls for dog hair. And once you get to the truly fun part -- pushing the dough through the pasta machine -- both hands are committed. One for cranking, the other guiding. I suppose I could've asked my wonderfully patient spouse (WPS) to help, but secretly, I think he thinks I'm kind of weird for taking pictures of food. Plus, somebody needed to keep track of the US-Canada gold medal hockey game. I'm not complaining. Especially because WPS did offer to clean up the kitchen. 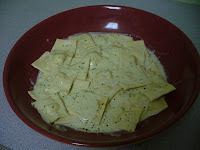 Ravioli (filled with ricotta, pancetta, fresh basil and a skiff of lemon zest) in a pesto cream sauce will, most definitely, inspire such altruism. The point being in all of this -- it's basically impossible to single-handedly document the process of making pasta. So you'll just need to be satisfied with before-and-after pictures. And, if you're lucky, the leftovers.